Another ALDI Special Buys Deals A Fresh New You 23 Jan Catalogue seems to make you feel happy with the perfect savings and a wide range of products. First of all, you can find households from kitchen, bathroom and bedroom. Then when you buy all your house needs, the next step is shopping for your beauty in the gym during work out. Pans are the most commonly used kitchen utensils in the kitchen. Also, they should be suitable for health conditions as they are used in cooking. On page 2 you can check ceramic pots produced using natural raw materials are easy to use because they are non-stick. Moreover, the ceramic cookware is easy to clean with its non-stick feature. Bamboo products are completely natural. They are made from the crudest form of the tree. Therefore, when any bamboo product expires, it returns back to nature. So it is nice to use bamboo utensils such as cutting boards, spoon, and bathroom essentials such as bath caddy, and shower caddy. You can see amazing products with stunning prices. Healthy sleep is hardly possible when the preferred beds for sleeping or resting are not selected correctly. If you want to start the next day as fresh as a daisy, you should definitely choose your bed very carefully. 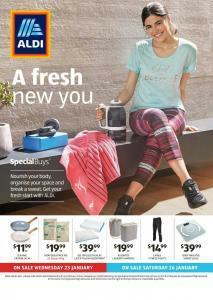 ALDI Specials Buy Catalogue offers you marvelous pillows, pillow sheets and beds with high quality.